show you all the truths I see. A worthy goal this desire to be authentic and original. My students talk about this often, but we know it's a difficult struggle. 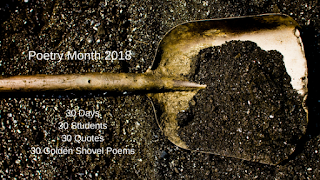 BTW, I'm in awe of your daily golden shovel poems. This is Duncan's plan as he ends his challenging journey in a gigantic public high school of 2300 and moves to a one-room schoolhouse of *18* 6-10th graders on Monday. We're excited but we all feel a little whiplash over our rapid decision-making process. That's authentic too! I love this - I think it should be a poster in a classroom. Maybe that's the perfect finish to a project like this - being paired with the perfect photograph.